I can't believe this is the 24th block I've made for this series! 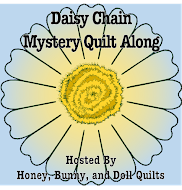 If you are new to the series, check out the Quilter's Recipe Box tab at the top for an overview and a look at all the blocks I've made so far. This block is from EQ7 and is another in their Dessert titled blocks - Peach Cobbler. For this block, you will need five 3 1/2 inch squares of a feature fabric, two 3 7/8 inch squares of a coordinating fabric and a background fabric for the star points. Cut four 2 inch squares of a contrasting fabric, and twelve 2 inch squares of a light fabric to make the square in a square units. Notice how the contrasting color points toward the center of the block. Now make the four half square triangle units for the friendship star part of the block. Arrange them like you see below and sew your units together to make your block. Isn't this a pretty variation on the Friendship Star block? I always think that each block I make is my favorite :) This one is another favorite! Next week I'll be sending out my monthly newsletter and I think I will have to come up with a block in Red White and Blue since the Fourth of July is on Tuesday! Wow, I can hardly believe I'm thinking ahead a bit - usually I'm a day late and a dollar short! Make sure you join me next week - I'm thinking I might have a little giveaway to celebrate Independence Day.